“[Mountain Meadows Massacre: Collected Legal Papers] is divided into four main topics across two volumes. They are “Initial Investigations and Activities,” “Indictments and Related Legal Proceedings,” “Trial Court Proceedings,” and “Trial Aftermath.” In addition, there is an Appendix that contains an interview of James Haslam from 1884. There is also a tremendously useful Biographical Register that is 85 pages in length and a Glossary of Legal Terms that is 11 pages in length. As the editors summarize, “This collection thus chronicles the almost forty-year history of the investigation and prosecution of the crime – from the first massacre reports to the dismissal of Higbee’s indictment in 1896” .” Full review available here. Two new volumes contribute to understanding the Mountain Meadows Massacre. 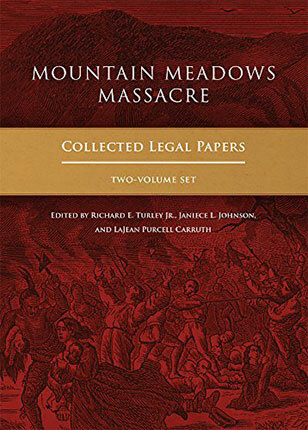 The volumes, titled Mountain Meadows Massacre: Collected Legal Papers, Initial Investigations and Indictments, and Mountain Meadows Massacre: Selected Trial Records and Aftermath, are now available. With more than a decade of exhaustive research, the editors of Mountain Meadows Massacre have made available in these two new volumes the nearly forty-year history of investigation and prosecution of the massacre. Additionally, this website publishes supplemental material, which consists of thousands of pages of trial transcriptions, not available in print. For details about the archive, see mountainmeadowsmassacre.com/legal. Mountain Meadows Massacre: Collected Legal Papers is available now from the University of Oklahoma Press and Amazon.com.